To look on me for a while. Commend me to her heartily! Today is Whitsun Tuesday and so here is Christina Rossetti's poem, appropriately, 'Whitsun Tuesday'. I hadn't realised this before but apparently she wrote poems for almost every significant date in the church's calendar, as devout Victorian poets sometimes liked to do (under the influence of Keble's immensely popular The Christian Year, I suppose). Rossetti's collection is called Some Feasts and Fasts and some of the poems aren't... great, but others are rather good when read in isolation - one of her most famous poems, 'Love came down at Christmas', among them. You can make up your own mind about 'Whitsun Tuesday'. According to Thy Will whose Will is best. Soft-voiced, and satisfied in humble nest. When Thou shalt say, "Winter is past and gone:"
Come hither, sit with Me upon My Throne." I have a confession: I just don't get Pentecost (or Whitsun, or whatever you like to call it). 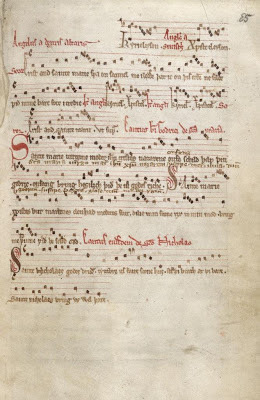 Almost every other occasion in the church's year has some meaning for me, and if nothing else I can always make some kind of connection with the imagery or the music or the story of it, but Whitsun is just - there. And this is unfortunate, because you're meant to be all excited and spirit-filled and burning with passion (or whatever it was Ælfric was talking about in that sermon I posted earlier) and I really just never feel that way. I think it's because it's all rather intangible - ironically, for a feast which is about spirit becoming visible. So for this reason I was interested to read today George Herbert's poem 'Whitsunday', in which he seems to reflect something of the same sense of disappointment - though maybe I'm reading my own feelings into it. He describes how glorious the first Pentecost was - so wonderful that the stars themselves "were coming down to know / If they might mend their wages [i.e. 'change their jobs'!] and serve here". At that time the Spirit, he says, 'kept open house' (that's a nice choice of phrase; it reminds me of what Herbert says elsewhere about what flowers do in winter), but now the door is shut: "Scarce a good joy creeps through the chink". Ouch. I think "if the braves of conqu’ring sinne / Did not excite thee, we should wholly sink" means something like 'if you weren't roused to action by the boasts of sinners, you'd just let us sink altogether'. And the last verse, while beautiful in itself, doesn't really resolve the question: Herbert comes back to belief in "the same sweet God of love and light" and suggests Pentecost isn't as good as it was once because we're not as good, since we change but God doesn't. Well, maybe. But for me, the image from this poem which lingers in the mind is that closed door. We wurðiað þæs Halgan Gastes to-cyme mid lofsangum seofon dagas, forðan ðe he onbryrt ure mod mid seofonfealdre gife, þæt is, mid wisdome and andgyte, mid geðeahte and strencðe, mid ingehyde and arfæstnysse, and he us gefylð mid Godes ege. We celebrate the coming of the Holy Ghost with songs of praise for seven days, because he inspires our minds with sevenfold gifts: that is, with wisdom and understanding, with counsel and strength, with knowledge and piety, and he fills us with awe of God. 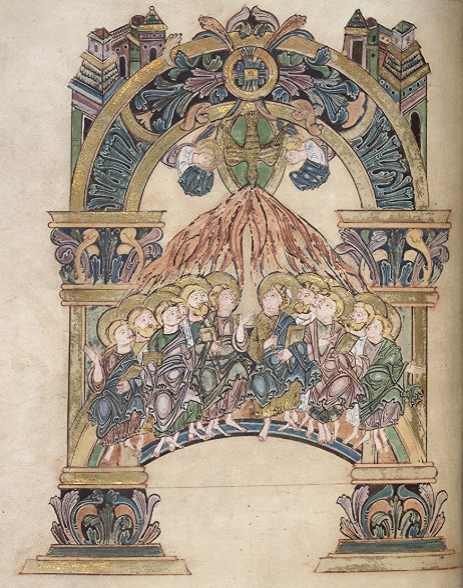 This is an extract from a sermon for Pentecost by the Anglo-Saxon homilist Ælfric, in which he reflects on the symbolism of the Holy Spirit appearing as a dove and as tongues of flame. It makes a nice companion to Ælfric's homily on Candlemas, where he also talks about doves and kindling, but for a different purpose. The Holy Ghost appeared over the apostles in the form of fire, and over Christ at his baptism it appeared in the likeness of a dove. Why did it appear over Christ in the form of a dove? Why over Christ’s followers in the likeness of fire? We read in books about that kind of bird, that its nature is very meek, and innocent, and peaceful. The Saviour is the Judge of all mankind, but he did not come to judge mankind, as he said himself, but to save. If he had chosen to judge mankind then, when he first came to earth, who would have been saved? But he did not want to condemn the sinful by his coming, but wanted to gather them into his kingdom. He wanted to guide us first with gentleness, so that he might afterwards save us at his judgement. This is why the Holy Ghost was seen above Christ in the likeness of a dove, because he was dwelling in this world in meekness, and innocence, and peacefulness. He did not cry out, nor was he inclined to bitterness, nor did he stir up strife, but bore the wickedness of men in his gentleness. But he who at his first coming was gentle, so that the sinful might be converted, will give a stern judgement at his second coming to those who do not heed. In the likeness of a dove and in the form of fire God’s Spirit was manifested, for he causes those whom he fills with his grace to be meek in innocence and burning with the will of God. Meekness is not pleasing to God without wisdom, nor wisdom without meekness – as it is said of the blessed Job, he was meek and righteous. What is righteousness without meekness? And what is meekness without righteousness? But the Holy Ghost, who teaches righteousness and meekness, should be manifested both as fire and as a dove, because he causes the hearts of those men whom he enlightens with his grace to be blameless through innocence, and kindled by love and wisdom. As St Paul said, God is a consuming fire. He is a fire unspeakable and invisible. Of that fire, the Saviour said "I come because I wish to send fire on earth, and I want it to burn." He sent the Holy Ghost on earth, and he by his inspiration kindled the hearts of earthly men. The earth burns when the heart of an earthly man is kindled to the love of God, which before was cold because of fleshly lusts. The Holy Ghost does not exist in his nature in the form in which he was seen, because he is invisible; but for the sake of the symbol, as we have described, he appeared as a dove and as fire. In the Greek language he is called Paraclitus, that is, Comforting Spirit, because he comforts the sorrowful who repent of their sins, and gives them hope of forgiveness, and lightens their troubled minds. He forgives sins, and he is the way to forgiveness of all sins. He gives his gifts to whomever he will. To some men he gives wisdom and eloquence, to some good knowledge, to some great faith, to some the power to heal the sick, to some the power of prophecy, to some the power to distinguish between good and evil spirits; to some he gives various languages, to some interpretation of various sayings. The Holy Ghost does all these things, distributing to everyone as seems good to him; for he is the Almighty Maker, and as soon as he enlightens the mind of a man, he turns it from evil to good. Se Halga Gast waes æteowod ofer ða apostolas on fyres hiwe, and ofer Criste, on his fulluhte, on ante culfran anlicnysse. Hwi ofer Criste on culfran hiwe? Hwi ofer Cristes hirede on fyres gelicnysse? 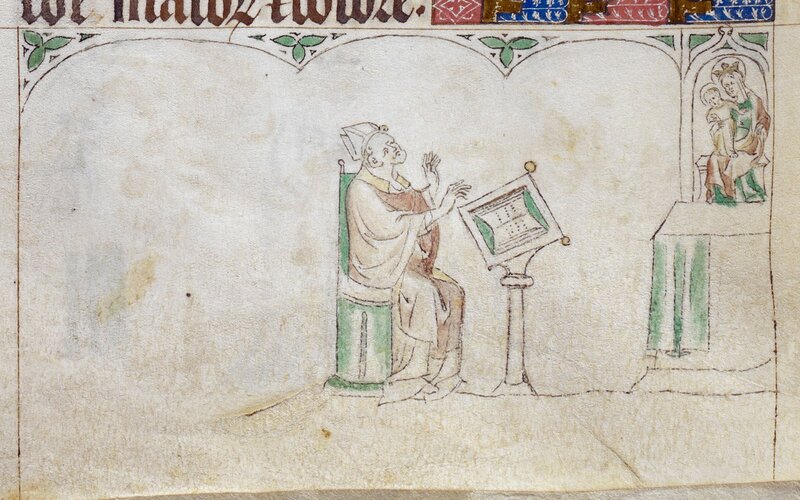 On bocum is gerædd be ðam fugelcynne þæt his gecynd is swiðe bilewite, and unscæððig, and gesibsum. Se Hælend is ealles mancynnes dema, ac he ne com na to demenne mancynn, swa swa he sylf cwæð, ac to gehælenne. Gif he ða wolde deman mancynn, ðaða he ærest to middangearde com, hwa wurde þonne gehealden? Ac he nolde mid his to-cyme ða synfullan fordeman, ac wolde to his rice gegaderian. Ærest he wolde us mid liðnysse styran, þæt he siððan mihte on his dome us gehealdan. Forði wæs se Halga Gast on culfran anlicnysse gesewen bufan Criste, forðan ðe he wæs drohtnigende on ðisre worulde mid bilewitnysse, and unscæððignysse, and gesibsumnysse. He ne hrymde, ne he biterwyrde næs, ne he sace ne astyrede, ac forbær manna yfelnysse þurh his liðnysse. Ac se ðe on ðam ærran to-cyme liðegode, þam synfullum to gecyrrednysse, se demð stiðne dom þam reccleasum æt þam æfteran to-cyme. the Son of God, dispenses to us his gifts on earth. This is a mixture of the Biblical and the specifically Anglo-Saxon - climbing trees and sailing ships not being among the gifts listed in Corinthians. Here are some pictures from a recent visit to the church of St Martin's in Canterbury, said to be the oldest church in the English-speaking world which is still in use. 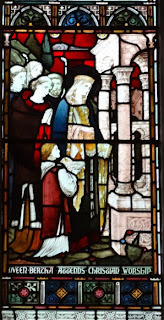 It was already a church when Augustine arrived to convert the Anglo-Saxons in 597: it had been a Christian site in Roman times, and when the Frankish princess Bertha married King Ethelbert of Kent, the king, himself a pagan, gave his wife and her chaplain this church to worship in. 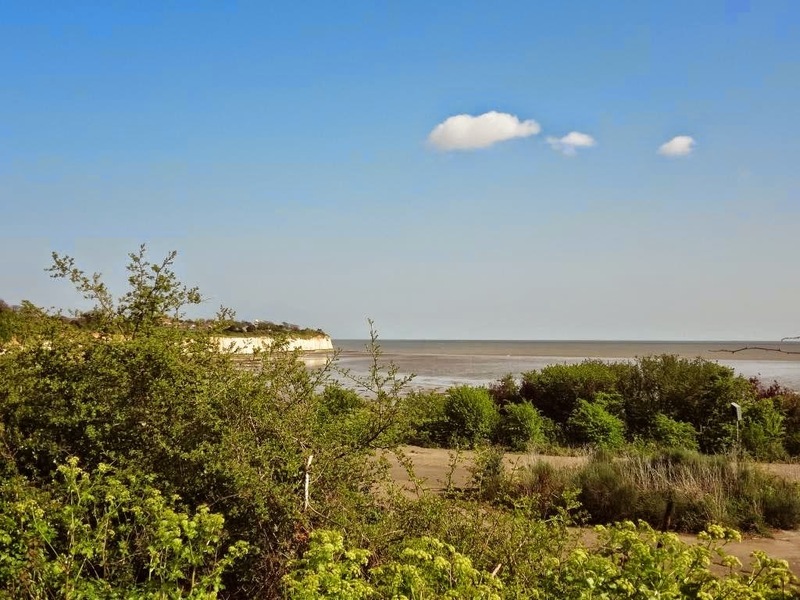 What's more, the fact that it was correctly known to be a Christian church in Ethelbert's time, centuries after the end of Roman occupation, suggests that there may have a small community of British Christians continuously worshipping at the site all through the intervening period. So this church has certainly been in continuous use for the past 1400 years, and perhaps for another few centuries before that. It's a little way outside the city walls of Canterbury, on the road that leads eastwards to the sea (roughly along the Roman road to the port of Richborough). The monastery of St Augustine's, about which I wrote recently, is on the same road, between St Martin's and the city. How I love those towers! This part of the church is only (!) thirteenth century; the part used by Queen Bertha is the chancel, underneath which are the foundations of the Roman building. The wall around her is more Saxon work making use of Roman materials. 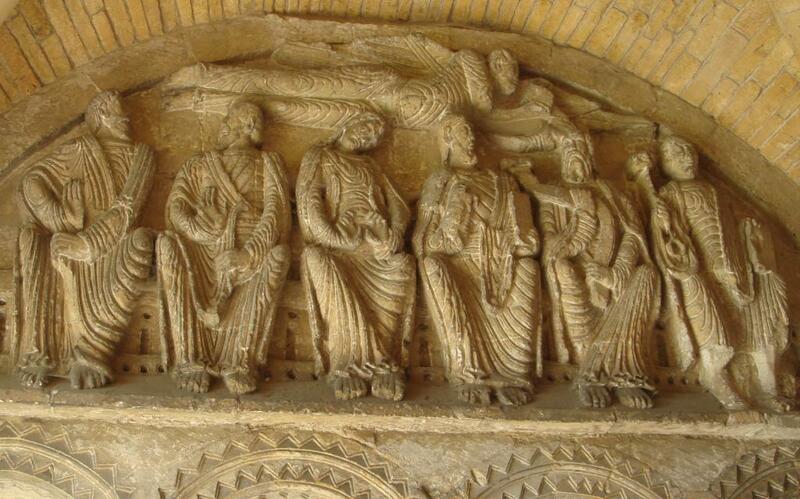 It's made of Caen stone and was probably made at the time of the building of the Norman cathedral in the last quarter of the 11th century. The guidebook compared the carved arcade along the top of the font to the pillars of the crypt at the cathedral, the oldest part of the present building. Columns and arcading I know nothing about, but I was excited to think that perhaps Anselm and Eadmer and Osbern had seen this font. Complete with Saxon plaits, as always! The Venerable Bede, one of medieval Europe's greatest scholars, is commemorated on 25 May. He actually died on the 26th, but as that's the same day as St Augustine of Canterbury (and isn't that a nice coincidence? ), he gets his own feast today. 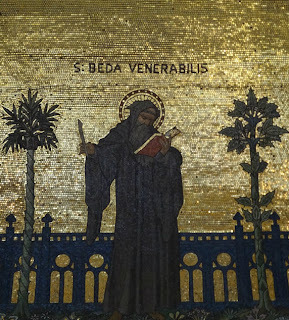 Everyone loves Bede and the internet is full of information about him, so I don't have much to contribute; but there's one story of his which never gets tired, however many times you read it. 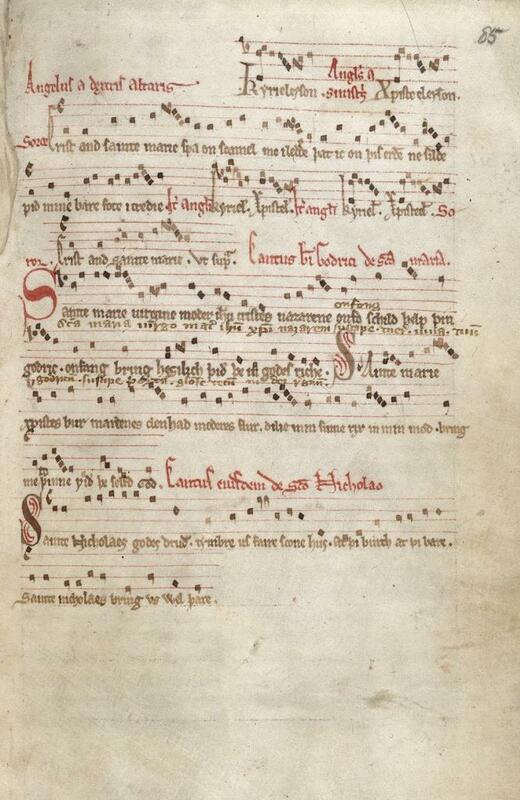 "Þyslic me is gesewen, þu cyning, þis andwearde lif manna on eorðan, to wiðmetenesse þære tide þe us uncuð is, swylc swa þu æt swæsendum sitte mid þinum ealdormannum 7 þegnum on wintertide, 7 sie fyr onælæd 7 þin heall gewyrmed, 7 hit rine 7 sniwe 7 styrme ute; cume an spearwa 7 hrædlice þæt hus þurhfleo, cume þurh oþre duru in, þurh oþre ut gewite. Hwæt he on þa tid, þe he inne bið, ne bið hrinen mid þy storme þæs wintres; ac þæt bið an eagan bryhtm 7 þæt læsste fæc, ac he sona of wintra on þone winter eft cymeð. Swa þonne þis monna lif to medmiclum fæce ætyweð; hwæt þær foregange, oððe hwæt þær æfterfylige, we ne cunnun. Forðon gif þeos lar owiht cuðlicre 7 gerisenlicre brenge, þæs weorþe is þæt we þære fylgen." "O king, it seems to me that this present life of man on earth, in comparison to that time which is unknown to us, is as if you were sitting at table in the winter with your ealdormen and thegns, and a fire was kindled and the hall warmed, while it rained and snowed and stormed outside. A sparrow came in, and swiftly flew through the hall; it came in at one door, and went out at the other. Now during the time when he is inside, he is not touched by the winter's storms; but that is the twinkling of an eye and the briefest of moments, and at once he comes again from winter into winter. In such a way the life of man appears for a brief moment; what comes before, and what will follow after, we do not know. Therefore if this doctrine [Christianity] offers anything more certain or more fitting, it is right that we follow it." This is from the Old English translation of Bede's Historia ecclesiastica, made in the ninth century; you can read a modern English translation of the Latin original here (II:13). 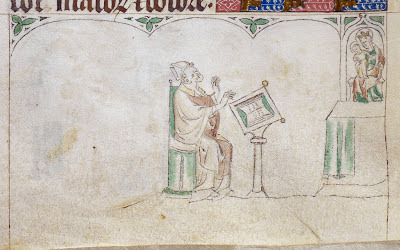 We don't know the name of this counsellor of Edwin, if indeed he ever existed and this is not merely Bede adapting a common homiletic idea which seemed appropriate for the situation. 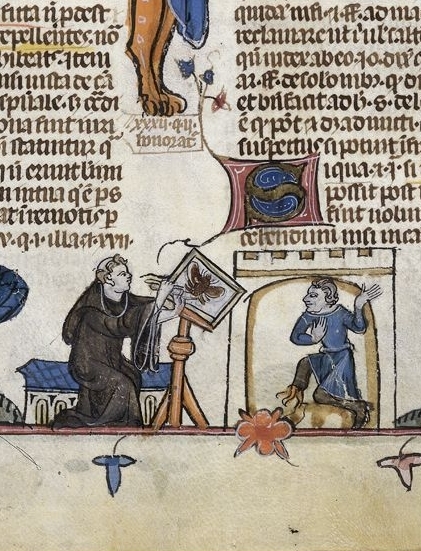 But whether it was Bede or the anonymous ealdorman, he gave voice to an idea which is thoroughly typical of Anglo-Saxon poetry, both Christian and secular - and to a description of the human condition which is no less moving today. Doesn't it just. Here are two poems which don't have much in common except that they offer the only reliable comfort in this lonely world: sleep and oblivion. This is Ian Bostridge singing Benjamin Britten's setting of Louis MacNeice's poem 'Cradle Song for Eleanor'. Fresh water springs come up through bitter brine. I'm always surprised when I run across a Tennyson poem I don't know, but this one was new to me today. It's an early poem, published when he was 24 years old (!) 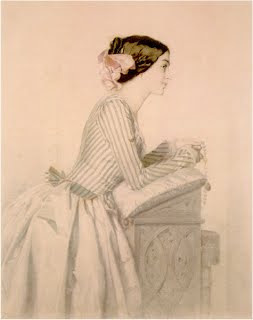 in his second collection of poems, in 1833, the same year that Arthur Hallam's death was to change his life. The poem looks straightforward but there are some interesting things about it: the distinction between inner and outer worlds of pain; 'clear love' (what does that mean? ); that wonderful image of fresh water springing up through brine. Since visiting Tennyson's haunts on the Isle of Wight a little while ago, I can no longer think of him without thinking of Julia Margaret Cameron, who lived nearby and illustrated some of Tennyson's poems with her photographs (and it occurs to me now that the village they lived in is called Freshwater; what an odd coincidence). 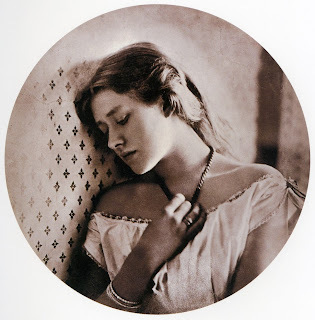 So the picture is her portrait of Ellen Terry, called 'Sadness'. People always talk about how dull Sundays were in the days before Sunday trading, when the Sabbath was strictly kept, and I'm sure they could be tedious. But this is the other side of it, which you don't hear so much about: a true day of rest, set aside from the cares and business of the week - whether "useful daily toil" or "so many talents wasted/so few bright laurels won" - a day of reflection and peace, to make us stronger for the week ahead. No wonder this hymn calls it the 'dear Sabbath'. Roll ye mists on Morven. Fire his tales of Morven. Hurled their might on Morven. 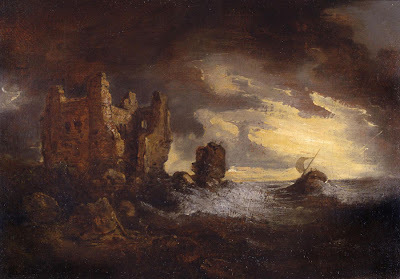 This dramatic piece of Victorian Scottish antiquarianism is by Harold Boulton. I don't know much about Ossian and his laments, but you don't really need to in order to enjoy the awesomeness of this song. The tune is an old Highland melody with a super-dramatic setting by Malcolm Lawson, like thunder clouds rolling; you can sort of hear it in this recording at Amazon. Innistore, according to the note in Songs of the North, is "the Orkney Islands, then like many of the Islands under the dominion of the Scandinavian Kings, who were frequently at war with the Celtic Fingalians of the Mainland". Oh, those Scandinavian kings, always at war with someone. Archaeology helpfully confirms the historical records, since just last year there was a very exciting discovery in Ardnamurchan: a Viking ship-burial complete with the body and artefacts. It pleases me to add to this pious deed performed on behalf of a little boy another act of love of this most loving father carried out for the boys of the church. The feast day of the birth of Christ was approaching [in the year 1067]. It was an ancient custom in that same monastery on the fifth day before this feast that the boys… within the schools be beaten with severe and excessive lashes. This punishment of the wretched boys was inflicted not for any sins committed but out of custom, and for that reason they were in no way able to escape it, except when the strenuous intercession of advocates might reduce the viciousness of the schoolmasters. And so on a certain occasion the teachers were of one mind and inflamed with such great wrath against the boys that no prayer by their advocates, no intercession poured forth by anyone on their behalf could at all succeed in calming the madness which had seized them. The wretched boys knew not what to do nor where to turn. Only one refuge remained, to invoke the love of loving Dunstan. Already on the night before this unspeakably cruel event the boys were trembling with fear when behold, the loving father, appearing to one of the boys in a dream, asked in a gentle manner why he and his companions were afflicted with such grief. And he, unaware of who it was that spoke to him, broke out in tears and explained how the rage of the teachers had conspired against them without a thought for mercy. Hearing these things the boy awoke and turning over what he had heard in his mind he vacillated between hope and fear. And now, dawn, that is, the dreaded hour, had arrived; armed with bull-hide whips and knotted lashes the teachers stood waiting in opportune places for the boys to pass by there. But suddenly all at once a most deep sleep enveloped those malevolent men, so that none of them was able to stop the boys passing through their midst, nor to inflict injury upon anyone. It was not the viciousness which they bore against the innocent children that roused the teachers from their slumber, but the singing and rejoicing of these innocents, and the high feast itself. They were confused, and regretted too late that by falling asleep they had lost the chance to indulge their savagery, from which they had allowed the boys to escape without anyone interceding on their behalf. What in fact happened afterwards proved this premonition to be true. For only a few days after these things had happened the city, together with the whole church and the workplaces of the servants of God, was consumed by fire. Nevertheless it transpired through the great mercy of God and the intercession of holy Dunstan that two buildings, without which the brothers could not have existed, remained unscathed by the conflagration, namely the refectory and the dormitory with the cloisters which adjoined it. 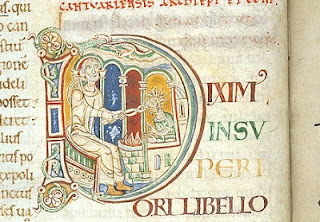 Eadmer of Canterbury, Lives and Miracles of Saints Oda, Dunstan and Oswald, ed. and trans. Andrew J. Turner and Bernard J. Muir (Oxford, 2006), pp.173-5. The fire which Dunstan's ghost predicted, as it left its grave and walked to and fro, took place on 6 December 1067, and destroyed the Anglo-Saxon cathedral - a catastrophe for Christ Church, following close on the heels of the Norman Conquest, with which this miracle-story is obliquely linked. Not everything in this tale quite makes sense (the dating is a bit off), but it's an intriguing glimpse into community politics at a very tense time for England and Canterbury. It seems likely that the Harold whose son's presence caused Dunstan's spirit such distress was Harold Godwineson (Osbern in his version of the story talks about 'Earl Harold'). If so, this unbaptised child, who presumably died in infancy, must have been the son of Harold and his long-time consort Eadgyth. As earl or king, Harold might well have had the power to have his child buried near St Dunstan's tomb, but he was, of course, a controversial figure in 1066-7 - no surprise if some of the monks objected to his son being buried at Canterbury! Was it disapproval of Harold, or of his irregular relationship with Eadgyth, which made the burial so controversial? Or was someone worried that it was dangerous for Christ Church to appear too loyal to the dead king? Either way, the tension had apparently filtered down to the boys, and found expression in this tug-of-war over Dunstan's wishes and the masters' cruelty. It suggests something about the way the potency of a great name can linger on within a community; none of the boys in this story were old enough to remember Dunstan, but they knew that invoking his name would win their case for them. Similar miracles involving protecting children from a cruel beating are attributed to other saints, including St Eormenhild, and here it perhaps reflects Eadmer's adoption of St Anselm's well-known opposition to corporal punishment for the young. However, I like Nicholas Brooks' comment on this story, from his The Early History of the Church of Canterbury: "Some will also see in the story evidence of a brutal and unimaginative discipline; others evidence that even in the eleventh century middle-aged and elderly Englishmen liked to recall the corporal punishment that had characterized the educational system of their youth". (There was no corporal punishment in my youth, but I've certainly heard old men at high table in Oxford reminiscence fondly about what they endured at public school - bizarre as it sounds to people like me!) More than nostalgia, however, this is a complex and extraordinary story - slightly unpleasant in some ways, but an incredibly vivid insight into the life of a monastic community under great strain. "was able to lighten the woes of his sons by great miracles. One of these I have not seen in writing, though I recently heard it narrated by a monk of Christ Church [probably Eadmer]. A thief, condemned to fall to his death, called on the aid of St Dunstan; his eyes already blindfolded, he was pushed away by his executioners and leapt into the chasm, but without coming to any harm. The blessed Dunstan spoke with him in person there, and removed his bandages. The poor man, heartened by this help, found his way along rough paths to higher ground; an invisible hand on his back supported him as he clung to the cliff-face, and prevented him slipping backwards". William of Malmesbury, Gesta Pontificum Anglorum, ed. and trans. Michael Winterbottom, vol.II, p.15. High cliffs were no match for Dunstan, of course. I thought a few of my readers might be interested in pictures of some of Oxford's Ascension Day traditions. Like many parishes in England, the city centre churches here continue the ancient practice of 'beating the bounds' of the parish, because it's Rogationtide, the time when you pray for blessings for your land. There's not a lot of farmland in central Oxford but there are a lot of fertile young minds, and they need blessings as much as anyone. Lincoln and Brasenose have their own separate tradition on Ascension Day, commemorating the historical rivalry between the colleges. The colleges back onto each other, and at noon on Ascension Day, for five minutes only, the underground passageway which leads from one to the other is opened and Brasenose students go through into Lincoln. There Brasenose students are served with free beer, laced with ivy, supposedly in reparation for the fact that Lincoln once, in the time of town riots in Oxford, refused to admit a Brasenose student who was being chased by a mob. Having drunk the disgusting beer, we gather in Lincoln's beautiful quad to watch pennies being thrown from their tower to waiting children below. It's an eccentric form of almsgiving! Viri Galilaei, quid admiramini aspicientes in caelum? They scrabble for pennies. We all learn a lesson about greed. It's pretty great. The mercy of his God was with him, and he found favour with a local magnate, who looked after him with a father's affection during his exile. This nobleman's care saw to his everyday needs with all kindness. Yet Dunstan's mind was constantly back in the land from which he had been expelled so remorselessly. Often did he lament, shedding floods of tears, whenever, now an exile, he recalled the grand religious life he had left behind in his monastery. He had long been taken up with doleful reflections of this kind, when lo and behold! he saw one night in his sleep a vision of the familiar scenes he so eagerly conjured up in his mind while awake. He was back in his familiar monastery, his band of brethren by him, singing Vespers, and, after the final canticle, 'My soul doth magnify the Lord', [they sang] the antiphon 'Wherefore did ye detract from the sayings of truth? You put together words to reproach, and strive to overthrow your friend. Yet...' At this point in Dunstan's dream, they all stopped singing at the same moment and fell quite silent, unable to find the voice or the words to finish the antiphon. And though they vainly tried again and again, they could only sing as far as the same place as before, never able to add the two last words. In his dream, Dunstan rebuked them: 'Why won't you finish the antiphon with "complete what you design"? From another quarter he at once heard the reply of God: 'Because, I say, they will never bring to pass what they are plotting, namely your expulsion from control over this monastery.' And waking up from his dream he gave thanks to the Almighty for consoling him. The Early Lives of St Dunstan, ed. and trans. Michael Lapidge and Michael Winterbottom (Oxford, 2012), pp.73-5. It turned out all right for Dunstan: Eadwig only reigned four years, and was followed by his brother Edgar, one of Anglo-Saxon England's greatest kings and a firm supporter of the church. 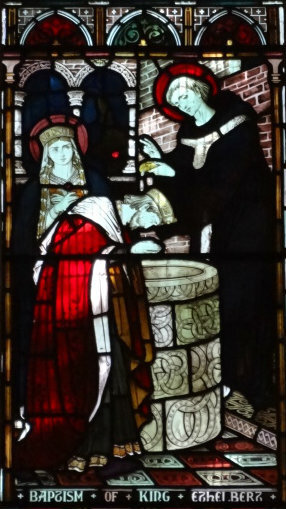 Under Edgar Dunstan became Archbishop of Canterbury; the service which Dunstan devised for Edgar's consecration is still the basis of the coronation ceremony for British monarchs, more than a thousand years later. According to legend, the great Archbishop Dunstan had a number of encounters with the devil. 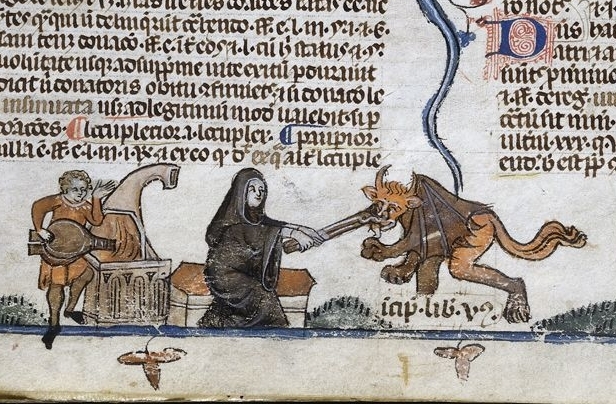 The most famous story, which entered popular folklore, tells how he pulled the devil by the nose with his blacksmith's tongs (as depicted above in a twelfth-century Canterbury manuscript!). The story goes that while he was living as a hermit in a cell at Glastonbury, after leaving the royal court as a result of the events in yesterday's post, he continued to occupy himself with his various crafts, including metalwork. One day, as evening was coming on, an old man appeared at his window and asked him to make a chalice for him. Setting aside what he was working on, Dunstan agreed to the request and set to work. But as he was working his visitor began to change shape: one moment he was an old man, then a young boy, then a seductive woman. Dunstan realised that his guest was the devil; but, pretending not to notice, he went on with his task. He took up the tongs from among his tools and laid them in the fire, waiting until they were red-hot. 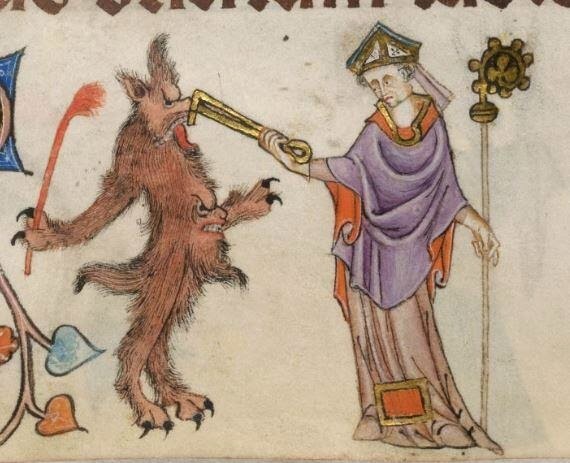 Then, pulling them out of the fire, he turned round and seized the devil by the nose with the tongs. The devil struggled and screamed, but Dunstan held on until at last he felt he had triumphed. Then he threw the devil out of his cell and it fled, running down the street and crying "Woe is me! What has that bald devil done to me? Look at me, a poor wretch, look how he has tortured me!" Many people heard and saw this, and the following day they came to Dunstan and asked him what had happened. He said to them, "These are the tricks of devils, who try to trap us with their snares whenever they can. But if we remain firm in the service of Christ, we can easily defeat them with his help, and they will flee from us in confusion." And from that time he dwelt safely in his little cell. On another occasion, when Dunstan was praying alone, the devil appeared to him in the likeness of a wolf with a gaping mouth, snarling and baring his teeth. Dunstan would not be distracted from concentration on his prayers, so the devil suddenly changed himself into a little fox, trying to get Dunstan's attention by jumping about, contorting himself and trying to get Dunstan to laugh at him. But, smiling a little, Dunstan only said, "You are revealing how you usually behave: by your tricks you flatter the unwary so that you can devour them. Now get out of here, wretch, since Christ, who crushed the lion and the dragon with his heel, will overcome you by his grace through me, whether you're a wolf or a fox." The episode with Dunstan nipping the devil by the nose is perhaps the best-known story about the saint. It first appears as told above in the late eleventh century, in the Life and Miracles of St Dunstan written by Osbern, precentor of the cathedral church at Canterbury. 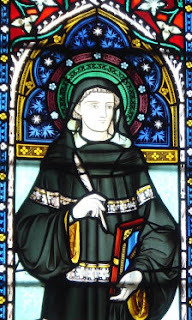 Osbern, who as a child had witnessed and been involved with several miracles attributed to St Dunstan, had a great personal devotion to the saint. He tells of a visit he made to Dunstan's cell at Glastonbury, and how deeply moved he was to touch the saint's own writing implements: he says that he wept copious tears, "for I remembered how often he had heard me when I called upon him in danger, and how mercifully he had helped me; and so I neither wished to restrain my tears nor to leave the spot". A writer and a musician himself, perhaps he saw in Dunstan a kindred spirit as well as a fatherly patron. 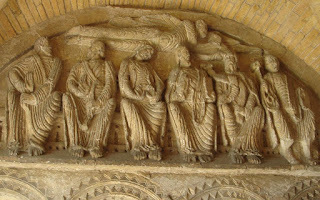 Dunstan had already been the subject of a fairly extensive Vita at the end of the tenth century, but Osbern rewrote it and provided the saint with a plethora of lively miracles - some of them reworked from the earlier rather dull Vita, some of them arising from a century of posthumous cures at Dunstan's tomb, but all of them testifying to Osbern's ear for a good story. There are a few Dunstan vs. the devil stories in the earlier hagiography (I considered why that might be here) but Osbern's are the first ones which are funny and entertaining. And so, the story of how Dunstan nipped the devil by the nose became a popular legend and a regular part of the iconography of Dunstan in the later Middle Ages and beyond. He twengde & ssok hure bi þe nose þat þe fur out blaste. He 3al & hupte & drou a3en & made grislich bere. He nolde for al is bi3ete þat he hadde icome þere! Forte it was wiþinne ni3te þat he ne mi3te iseo namore. "Out, wat haþ þis calwe ido? wat haþ þis calwe ido?" In þe contreie me hurde wide hou þe ssrewe gradde so. He ne hi3ede namore þuderward to tilie him of þe pose. The story became part of popular folklore, and for some reason was particularly associated with Mayfield in Sussex (where the medieval sources say Dunstan performed a different miracle: pushing its church into the proper east-west alignment with his shoulder!). A pair of tongs still preserved in Mayfield are said to be those which with Dunstan pinched the devil's nose. According to one version of the story, the injured devil flew off from Mayfield to cool his nose in the springs of Tunbridge Wells, and that's how its famous waters got their reddish tint (don't let anyone tell you it's because of the iron in the water). Alternatively, he flew away with the tongs still attached to his nose, and they dropped off in the place near Brighton which is now called Tongdean (for, I hope, obvious reasons). The second legend regarding the Devil and St. Dunstan also occurred in Mayfield when the convent there had just been built. The Devil appeared to St. Dunstan and said that he was going to knock down all the houses in the village. St. Dunstan bargained with the Devil and got him to agree to leave standing any house with a horseshoe on the outside. At that time, the custom of nailing horseshoes to doors for luck wasn't well known so the Devil agreed but St. Dunstan managed to nail a horseshoe to all the houses in the village before the Devil could get to them so the village was saved. The Devil managed to get some measure of revenge against St. Dunstan by repeatedly setting Mayfield church, then built of wood, off its normal East-West axis, leaving St. Dunstan to repeatedly correct it. He then proceeded to hinder the building of the new stone church. Another church is involved with yet another St. Dunstan story. This time it is the steeple of the church in the village of Brookland, just over the border into Kent. The Devil took the steeple and was chased by St. Dunstan who caused the Devil to drop the steeple near Hastings by application of the tongs mentioned in the Mayfield story. St. Dunstan then cooled his tongs in a spring in the Silverhill region of Hastings, which became chalybeate. Foggier yet, and colder! Piercing, searching, biting cold. If the good Saint Dunstan had but nipped the Evil Spirit's nose with a touch of such weather as that, instead of using his familiar weapons, then, indeed, he would have roared to lusty purpose. In guise of a damsel passing fair. He took up the tongs and caught hold of his nose. So Barham makes up his own story, which I recommend to all medievalists who want to know what rhymes he finds for 'witangemot', 'Elgiva', 'Saxon', and 'Reginald Heber'.